Nursing A Highly Responsible and Noble profession.This profession demands a lot of Time, Dedication, Patience, Sacrifice, Love and Care for the sick patients, ability to think in crisis, good Team sprit etc. 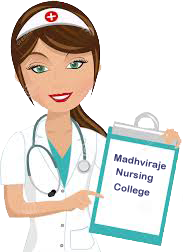 With the advancement in medical sciences, There has been a constant improvement in the nursing education standard. As the number of Hospitals, Nursing homes, Sanatoriums and Private Clinics are increasing, Employment opportunities are immense, both in INDIA and Foreign countries. The demand for skilled and qualified Nurses is ever present throughout the world. It is estimated that there would be a demand of around 6 Lakh Nurses in the near future to improve the existing nurses. Patients ratio, which is very low and unsatisfactory at present and as the government plans to widen the health services network, The demand for this profession would continue to grow. Nowadays even the corporate are entering this sector and scope has widened to pharmaceutical companies and private organizations, further making this profession an exciting career options. The scope of nursing is of great values in serving the mankind because it plays an important role in Planning, Organizing and Co-ordinating of health services at Primary, Secondary and Tertiary levels of Health Care.